Reference number for this case: 18-oct-54-SaintCirgues. Thank you for including this reference number in any correspondence with me regarding this case. 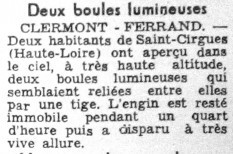 The regional newspaper Le Méridional for October 20, 1954, reported that two inhabitants of Saint-Cirgues, in the Haute-Loire, saw at high altitude in the sky, two bright balls that seemed connected by a rod. The "craft" was motionless for a quarter of an hour, then "disappeared at a very fast pace." In 1958, ufologist Aimé Michel explained in his book on the French saucers of 1954 that he got some details later. He dates the observation of October 18, 1954, late in the afternoon. Peasants had made the observation. The object was composed of two luminous balls connected by a "stem", also luminous, and during the quarter of an hour when it stayed in the sky, the center of the stem seemed to remain at a fixed spot while the two balls and the stem oscillated like the trays of a scale. Farmers at the main observation point said the whole thing was like a scale, and another group of peasants in the same area mentioned dumbbells. Michel indicates that the next day's newspapers scoffed at this by headlining "New Saucer Look: Dumbbells Take Off" or "The Scales Fly Off." After this quarter of an hour, the whole object had spun at full speed and disappeared behind the horizon. CLERMONT-FERRAND. 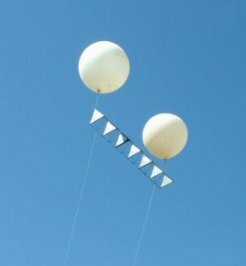 -- Two inhabitants of Saint-Cirgues (the Haute-Loire) saw in the sky, at very high altitude, two luminous balls which seemed linked together by a stem. The craft remained motionless during a quarter of an hour then disappeared at a very sharp pace. The French ufologist indicates in his book that according to the newspapers of October 20, and the details which he received later on, on October 18, 1954, in the end of the afternoon, in Saint-Cirgues in Haute-Loire, the peasants had observed a flying object at high altitude in the sky, composed of two luminous balls connected by an also luminous "stem," which had remained in the sky during a quarter of an hour during which the center of the stem seemed to remain in fixed position whereas the two balls and the stem oscillated as the plates of a balance. After a quarter of an hour of this sort of maneuver, the entire object flew away fast and disappeared at the horizon. While the peasants on the main location of observation had said that the object reminded of a balance, the object was seen by another group of peasants in the same area who evoked heavyweights. Michel indicates that the newspapers of the following day made fun of the case with headlines such as "New Look for the saucers: heavyweights take the air" or "balances fly away." He also said that the case was reported in the newspapers of October 20. The authors indicate that on October 18, 1954, farmers in the vicinity of St. Cirgues in the Haute-Loire, France, saw two luminous balls connected by a luminous rod. The middle of the "rod" seemed to be fixed, whereas the "balls" swayed like the pans on a balance, and the whole resembled a set of flying scales. After an estimated 15 minutes, the whole shot off at high speed and disappeared over the horizon. Other farmers in the same region who observed the phenomenon described the object as a "dumbbell." The incident was widely mentioned in the newspapers, and Aimé Michel mentioned it to Commandant Morin, the manager of the Ouest-France new paper. Morin remembered the incident, but said he thought it occurred in the Vendee, and thus, Aimé Michel searched through the newspapers in vendee and found that another very similar case had indeed occurred in the very south of Vendee or more exactly the Charente-Maritime on the same date. Charles Garreau recalls that the "balance" observed by Mr. and Mrs. Labussière had been seen a few hours earlier this same day, at Saint-Cirgues, in Haute-Loire. Farmers had noticed, at high altitude, the presence of a "luminous balance in all points identical." At the end of a quarter of hour, the "scale" had moved away at very high speed towards the west. It is to our knowledge, the only observation of an exchange of saucer pilots. Note that after this exchange, the luminous bar connecting the two balls did reappear. It should also be noted that a few hours earlier, at Saint-Cirgues, in the Haute-Loire, farmers had noticed, at high altitude, the presence of a "luminous scale" in all respects identical. At the end of a quarter of an hour, the "scale" had moved away at very high speed. Is this the same machine that was seen by these two different groups of witnesses? The author indicates that on October 18, 1954 in Saint-Cirgues in the Haute-Loire, a luminous object in the shape of a balance was seen by peasants. The source is indicated as Michel pages 233-234. Luc Chastan indicates that in the Haute Loire in St Cirgues on October 18, 1954 at an unknown hour, "In the end of the after moon, peasants observed a flying object at high altitude in the sky, composed of two luminous balls connected by an also luminous "stem", which had remained in the sky during a quarter of an hour during which the center of the stem seemed to remain in a fixed point while the two balls and the stem oscillated like the plates of a balance. After a quarter of an hour of this maneuver, the whole object fled at high speed and disappeared at the horizon. While the peasants on the principal place of observation had said that the whole evoked a balance, the object was seen by another group of peasants in the same area, who evoked sport weights." The website indicates that on 18 October 1954 at 18:00 in St Cirgues, France, "Dumbbell shape rotates, flys away. Explanation: Planet." "Hovering objects were observed. Two dumbbell-shaped objects were observed by seven male experienced witnesses in a pasture for over 15 minutes." The sources are indicated as Michel, Aime, Flying Saucers and the Straight-Line Mystery, S. G. Phillips, New York, 1958; Lorenzen, Coral E., UFOs: The Whole Story, Signet T3897, New York, 1969; Vallee, Jacques, Computerized Catalog (N = 3073); Vallee, Jacques, Challenge to Science: The UFO Enigma, Henry Regnery, Chicago, 1966; Vallee, Jacques, Preliminary Catalog (N = 500), (in JVallee01); Schoenherr, Luis, Computerized Catalog (N = 3173); Olsen, Thomas M., The Reference for Outstanding UFO Sighting Reports, UFOIRC, Riderwood, 1966; Hatch, Larry, *U* computer database, Author, Redwood City, 2002. If ever Aimé Michel had been mistaken with the date, and that the observation had taken place on October 16 and not on the 18th, then, it would be necessary to consider that this could have been the high altitude balloon spotted by the observatory of the Mount Ventoux. 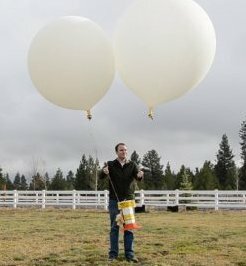 Even without date error, the possibility of balloons remains; I think of a device such as tandem balloons, connected by a cable carrying the radiosonde, or connected by some other device, as visible below. I specify that these are not tandem balloons of 1954; but I cannot exclude such an explanation for this observation, not least because the duration of the "disappearance" behind the horizon has not been given. [am1] "Mystérieux Objets Célestes", book by Aimé Michel, Arthaud publisher, France, page 192, 1958. [to1] "The Reference for Outstanding UFO Sighting Reports", book by Thomas Marshall Olsen, UFO Information Retrieval center, inc., Riderwood, Md, USA, page 18, 1966. [am1] "A Propos des Soucoupes Volantes", book by Aimé Michel, reprint of "Mystérieux Objets Célestes", Planète publishers, France, page 234, 1969. [lo1] "UFO - The Whole Story", book by Coral and Jim Lorenzen, The New American Library publishers, Signet Books, USA, page 172, 1969. [cg1] "Les Débarquements d'Humanoïdes", article by Charles Garreau, in "Les soucoupes volantes", Historia history magazine, France, special issue #46, special issue, page 72, January / March 1976. [ce1] "Dossier Célèbre", article in the CERPI (Centre d'Etudes et de Recherche des Phénomènes Inexpliqués) bulletin, Saintes, Charente-Maritime, France, #4, May 1976. [am1] "Mystérieux Objets Célestes", book by Aimé Michel, Seghers publisher, France, page 256, 1977. [js1] "Le Dossier 1954 et l'Imposture Rationaliste", book by Jean Sider, Ramuel publisher, France, page 210, 1997. 1.1 Patrick Gross December 26, 2009 Addition [to1]. 1.3 Patrick Gross October 12, 2016 Addition [lm1]. In he Explanations, addition of the paragraph "If ever Aimé Michel had been mistaken...". 1.4 Patrick Gross January 20, 2019 Additions [ce1], [lh1], Summary. In the Explanations, addition of what follows "Even without date error..."